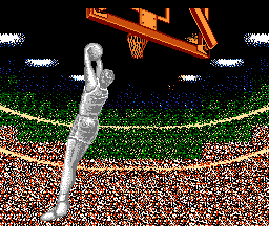 With the 2015 NBA Finals set to start tomorrow, I thought it’d be as good a time as any to look back on Double Dribble for the NES. It was an early success for the console when ported from the arcades in 1987. How does it hold up? Time takes its toll on most sport games, and Double Dribble is certainly no exception. Not only has it not aged as well as some other NES sport games, but it isn’t even the best basketball game on the console. Timeless appeal or not, I can’t help but try viewing it in the context of its release, coupled with a healthy dose of nostalgia. Rather than blinding me to the game’s faults, it helps me appreciate what it was. 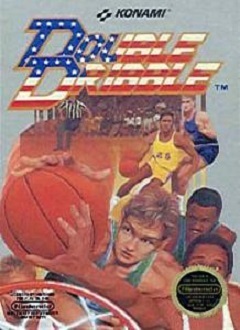 Even though it originates from the arcades, I feel Double Dribble is a sim at heart. Not to say it’s always accurate in how it portrays basketball, but the five on five contests strive to present more realistic action. What it lacks in gameplay it makes up for in presentation. Right from the start this is evident, as you watch a crowd filter into the arena while the Konami blimp and balloons fliy overhead. Even the menu excels with normally mundane choices made more lively from some catchy music and a player shooting the ball through the hoop as selections are made. The options include adjusting time periods and selecting from three levels of difficulty. The four generic teams you can choose from are listed under the cities of Boston, L.A, Chicago, and New York. The computer always picks Boston though, which limits your choice to three. A sizable weakness for sure, but the game is best played against a friend anyway. That’s how nostalgic memories were formed. Double Dribble has a lot of characters on screen, so expect sprite flicker (this may be improved on the Virtual Console). The main visual highlights are the cut scenes that show one of three slam dunk animations. These looked very impressive, especially for early NES! Other highlights include an animated halftime show, with unique mascots. The music is limited, but the tunes present are quality pieces. There’s even a small sampling of speech, albeit garbled. Hearing “Double Dwibble” still brings a smile to my face. The controls are very basic, and can seem sluggish. They are not always responsive either. Certain functions though, like stealing, are ridiculous in how easy they can be done with frequency. You’ll also be grabbing offensive rebounds like a young Charles Barkley. But whether your clanging dunks off the rim or sinking shots from a 3 point sweet spot, you’ll soon grow accustomed to things. 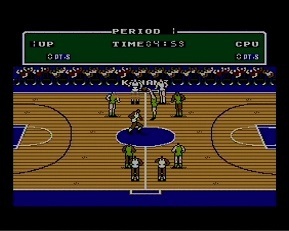 Double Dribble has a fun sequel on the Genesis (Playoff Edition) but the NES version is where I have the most memories. That said, Konami’s later sport efforts (Blades of Steel and the Track & Field games) have aged better. If you’ve never played Double Dribble, there’s really no compelling reason to start now. If you have strong memories of it though, know that it holds up well enough all things considered.